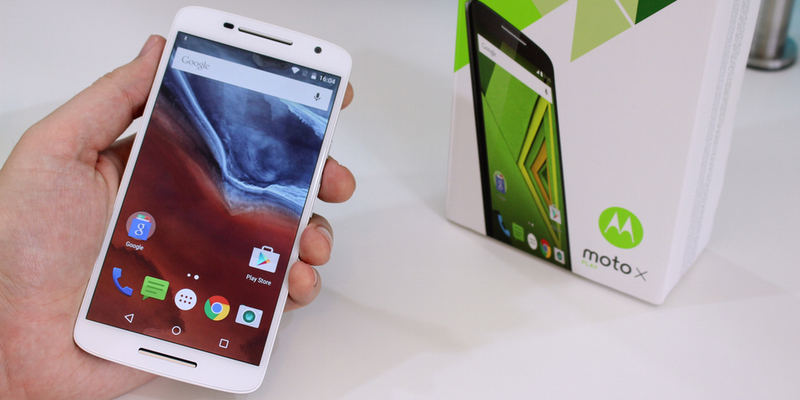 Just a few days ago, Motorola sent me its latest smartphone, the Moto X Play. It’s a sort-of halfway house between its super-affordable but awesome Moto G and the more premium unreleased Moto X Style/Pure. Although it’s not available in the US yet, it is available to buy in the UK and Canada, and evidence suggests it’ll be rebranded as a Verizon DROID of some kind. It costs under £300 in Britain, putting it in the same price range as devices like the OnePlus 2 and the 4GB Zenfone 2. In fact, it’s slightly more expensive than either of those. I’ve been using the device as my daily driver since I unboxed it, and for the most part, but almost every part of my experience could be described as ‘I love it, but…” Each part of the phone almost has something not quite right. It’s not perfect, but I still think it’s great overall. Despite being made of plastic, the Moto X Play feels great in hand. It’s light, and the grippy rear shell means it stays where you put it. It doesn’t slip around in my palm, or fall off the arm of my couch when I put it down. It’s super-comfortable, thanks to its curved back and I love the minimal look on the front. Where old Moto X phones in white were covered in black dots and holes where the sensors lived, this has just a camera and a single sensor. The rest is pure, brilliant white. It also happens to be water repellant. The downside? It’s all personal preference, but I’d definitely prefer a metal frame. After all, you get one with the OnePlus 2. It’s not a deal-breaker, but it would add a little durability to the design. And then there’s that display. It’s full HD, over 5.5-inches diagonally with a pixel density of 400ppi and it’s really bright. Even during the day, the brightness slider in the drop-down drawer barely makes it over the 50% mark on my phone. It never approaches 100%. It’s sharp, and content looks really clean and crisp mostly. Colors are really not so hot though. When you’re used to super-rich panels like the Nexus 6 with its pitch blacks and vibrant colors, going to the LCD panel on the X Play is almost painful. All the colors on the X Play seem a little too muted, and that’s not to mention how un-black the blacks are. Because of how bright it is, the blacks — more often than not — show up gray. The absolute best part of my experience so far is the battery life. It’s a whopping 3,630mAh capacity in a phone without a QHD resolution screen. I’ve charged it to 100% twice. The first time it was 2PM on August 26, I plugged it back in again on August 27 at around 10PM with the battery at around 20%. That was with heavier usage than I would typically use a device. As with any new phone, the first few days are heavy gaming, video watch, web browsing almost constantly. As I type this, my phone battery is at 33%, and I haven’t plugged it in since Thursday night. It’s safe to say, with moderate use, this is a 2-day battery. It’s worth noting, I’ve had my Moto 360 smartwatch connected most of the time too. Even with the battery life there’s a ‘but…’. My phone shipped with a regular charger. Despite the fact that the Moto X Play supports Quick-Charge technology, mine didn’t ship with a Quick-Charge adapter. If I didn’t already have one from my Nexus 6, charging this thing up would literally take hours. Thankfully, I can get it from 0-100% in less than two hours. I hate to think how long it would take with the included charger. I’ll skip the camera for now, but let’s just say, the 21MP camera is as mixed a bag as all the other elements of the phone. Including the performance which, two or three times a day, likes to remind you that it’s not a flagship. It’s worth mentioning, for a phone powered by Snapdragon’s budget 615 octa-core processor, it is remarkably smooth most of the time. I can’t help but think that’s mostly down to the device running a stock version of Android. But every once in a while it gets stuck. At least twice a day I go to load content on a web page, the Play Store, or a video on YouTube and it gets stuck ‘loading’. Waiting doesn’t help. The only thing that works is closing the app, and restarting it. And it happens just as I start to think ‘I really could use this as my daily phone with no problem.’ You’re lured in to a false sense of security, and it jumps out from behind a bush and goes ‘ha, gotcha!’. It was cute the first two times. After that, it’s just plain annoying. In every way, this is so close to being my perfect device, it’s unbearable. It looks and feels almost perfect, its battery is a Quick-Charger away from being amazing, the camera is good (if you don’t mind taking your time) and the display is just a little washed out. 90 percent of the time I love using the Moto X Play. It’s smooth, reliable, feels great. But, it’s almost as if Motorola deliberately held back to make us want to pay extra to get the more premium X Style. It’s like they sat around a table designing it with the motto ‘make it great, but not too great’.